Auli is situated at an altitude of 2500-3500 mts above sea level, in the lap of the snow-capped peaks of the Garhwal Himalayas is Auli, a popular ski resort. Experts have favourably compared the ski slopes of Auli to the best in the world. Its alpine atmosphere, its well-dressed slopes flanked by coniferous and oak forests, its challenging terrain. 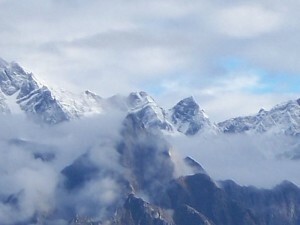 All make Auli a favorite destination for adventurous tourists. One of the best equipped in the country. Auli has excellent infrastructure, including a state of the art Ski Lift, an 800 mts long Chair Lift and a 3.9 km long Ropeway. You can also try your hand at Parasailing here. In summer the slopes of Auli are covered with wild flowers, the alpine grass is rich with fragrant meadows and the views of the Himalayan peaks like Nanda Devi, are truly breathtaking. Air: The nearest airport is Jolly Grant 270 km away. Rail: The nearest railhead is Rishikesh 300 km away. Road: Road is accessible by NH 58. This entry was posted in Auli, Uttaranchal and tagged about auli, auli garhwal, auli in india, auli india, auli map, auli tour, auli uttaranchal, auli uttaranchal india, auli uttrakhand. Bookmark the permalink.